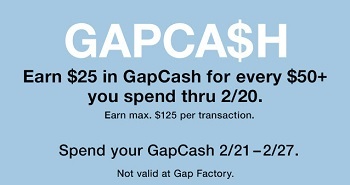 U.S. Gap is offering an amazing GapCash Event. Collect GapCash now and save later! U.S. GapCash: Earn $25 in GapCash for every $50 or more you spend from now through February 20, 2017. You can use your GapCash between February 21 and February 27, 2017. This offer is not valid at U.S Gap Factory Stores. Source of the information is U.S. Gap. More details about the offer available at U.S. Gap Store Locations or visit U.S. Gap online.